Life for an Amish quilter can be a very difficult and busy one. 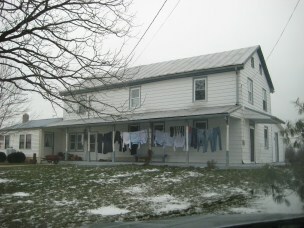 In addition to making her Amish quilts to be sold at the Amish market, the Amish quilter is also responsible for running the household, including cooking all the meals, cleaning the house, mending the clothes, tending to the children, doing the yard work, tending to the garden, and feeding the family livestock. How the typical Amish quilter even has time to hand make her many beautiful Amish quilts without the use of electricity is certainly a mystery. One of the most time consuming activities the Amish quilter has to attend to each and every day is the preparation of the many meals that the Amish consume throughout the day. The morning starts off for the Amish quilter with a little house cleaning, perhaps a visit to the animal pen to collect fresh eggs or milk, and then she must prepare breakfast while the rest of her family does their morning chores. The Amish eat an incredible amount of food each day because they are constantly working, so the breakfast meal is one of the most important meals of the day for the typical Amish family. Every morning the Amish quilter will usually prepare a breakfast for her family that might include scrambled eggs, bacon, cornmeal mush, dry cereal, fried potatoes, fresh or canned fruit, shoofly pie, milk, and juice. The breakfast meal is early, usually around 6:00 a.m., and the entire family will gather around the table together, say their morning prayers and eat their meal. There is little talk around the breakfast table, except for perhaps discussion of the work that the Amish quilter may have to do around the house that day or the assignment of additional chores that they children will be expected to complete after school. After the breakfast meal, the Amish quilter and the female children will clean up the table and the kitchen. The children will then get ready for school and the Amish quilter will put together the bagged lunches that the school-aged children will take with them to school. A typical lunch might include a sandwich, fruit, celery, and milk. During the colder winter months, the schoolteacher might use the stove in the schoolhouse to heat up hot items for the children to eat at lunch. The Amish quilter might send her children off to school with a foil wrapped potato, a jar of soup, hot dogs, or leftovers from dinner the night before that can be warmed on top of the stove during the morning and served when the schoolhouse lunch bell rings. Once the house is empty for the morning, the Amish quilter might be able to fit in some few precious moments to work on her Amish quilt, but she does not have much time because the next meal will be the midday meal, or dinner, at around 11:00 a.m. At this time, her husband and older children who are no longer in school will come home to eat dinner together as a family. Some Amish men and women must work outside of the Amish community, even for non-Amish companies or factories. This can cause a problem for Amish family life because the Amish put great value upon eating their meals together in order to keep in touch with all of the daily activities that are happening with the family throughout the day. In these cases, the Amish quilter will make her husband or children a sack lunch to take with them for dinner, but it is highly preferred that everyone gathers together for the midday meal. Food like pan-baked chicken, mashed potatoes and gravy, vegetable salad, sliced bologna, fresh-baked breads, and fruit will all likely be prepared by the Amish quilter for her family at dinner each and every day. Dinner is a time for the family to update each other on any of the happenings so far in the day. After the midday meal, everyone goes back to their work or chores. It is usually during this time that the Amish quilter will have a few hours to spend on making her handmade Amish quilts. Since the Amish do not use electricity, not even for indoor lighting, this time of the day is ideal for the Amish quilter because it is the time that the sun is at the highest point in the sky, letting in the most light for her to stitch her Amish quilts together in quiet. The next meal will come around 3:00 p.m. when the school children arrive home. The snack break might consist of sliced cheeses and meats, fresh fruits, or even a homemade pie that the Amish quilter may have just baked. After the snack break, the children carry on with their daily chores and it is about this time that the Amish quilter must prepare for the evening meal. Supper is usually served around 5:00 p.m. once the husband and older children have all arrived home after their workday. The Amish love rich, starchy, filling foods, so the supper meal can often consist of macaroni and cheese, meatloaf, chicken and dumplings, steamed vegetables, pasta, and a variety of handmade desserts. Not only is the Amish quilter an expert at sewing, she is also an expert baker. From her earliest days as a child, her mother taught her how to cook, bake, quilt, sew, garden, tend to the children, and do just about everything that her family might need her to do. So, when it comes to baking desserts, she might have prepared several delicious fruit pies, homemade cakes, and cookies, in between the million other things she has to do each day! After the supper table is cleaned, everyone will settle in for a quiet night of reading or playing games. The Amish quilter might work a little more on her Amish quilt by oil lamp light, but she will more likely spend this time writing letters, reading an Amish magazine, or spending time with the children. The final meal of the day will take place around 8:00 p.m. This is the nighttime snack and it usually consists of a tasty treat just before bedtime. The Amish quilter might make homemade pretzels, cookies, ice cream, or prepare lemonade and hot chocolate, depending on the time of year. Afterwards, the nighttime prayers will be said and everyone will retire for the night at around 9:00 p.m.
As you can see, the Amish quilter has a full plate when it comes to the many chores she must perform, including the many meals she must prepare throughout the day. It truly is amazing that Amish quilts are made at all once you realize how busy a day the Amish quilter has. However, this is the Amish way and they would not have it any other way, nor would we, the Amish quilting consumers! Why do Amish People Seem so Content? ​Nothing like visiting a Real Amish Market!